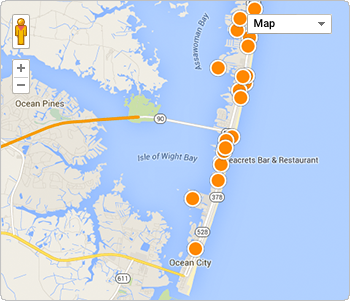 Ocean City Maryland is a vibrant coastal resort community. Famous for ten miles of pristine white sand beaches, classic boardwalk, hundreds of restaurants and night life opportunities, Ocean City is a place everyone can enjoy. It was selected as #1 affordable and fun city in the USA by Better Homes & Gardens magazine. Families can enjoy quiet areas to relax, visit beach concerts, play in the parks or participate in the active beach live style in community sport centers. Ocean City real estate will give you a choice to watch a beautiful sunrise on the oceanfront, scenic sunsets on the bay in the evening or both. Ocean City Maryland offers affordable waterfront living in private single family residencies or high-rise condominiums loaded with amenities. You can own a piece of paradise.